Could a change in the US political climate spark rapid growth in renewable energy? A group of progressive Democratic candidates believe that it can and voters are listening. 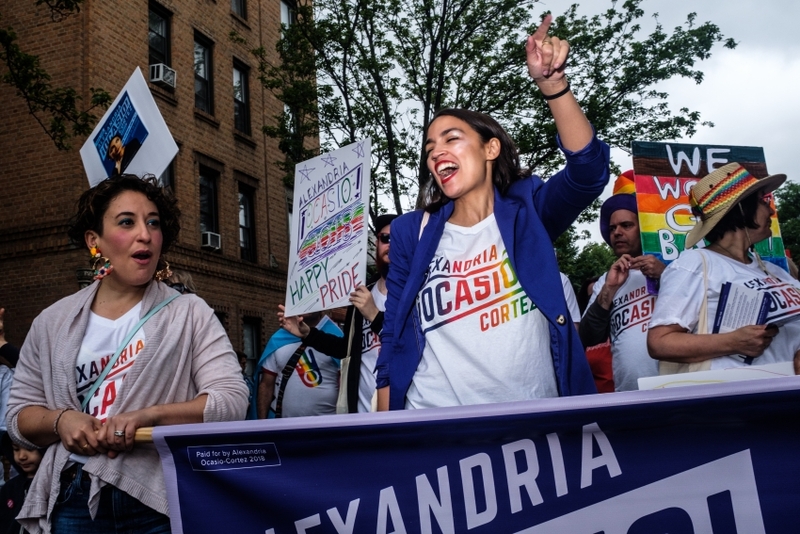 Alexandria Ocasio-Cortez, a 28-year-old New York Bartender turned Bernie Sanders campaign organizer, achieved a stunning political upset last month when she beat incumbent 10-term Congressman Joe Crowley in the primary elections for New York’s 14th district. In a predominantly Democratic, working class district, many see the upcoming mid-term elections as a mere formality on her path to public office. These candidates have embraced a set of uniform policies that disrupt the moderate appeal that mainstream Democratic leaders have sought to maintain. They are promising voters that if elected, they will fight to legislate Medicare for All, a Federal minimum wage of $15 per hour, free higher-education, and aggressive federal action on climate change. These positions, and their refusal to accept corporate donations has put them greatly at odds with the Democratic establishment. If elected into office, they could disrupt some of the fundamental Democratic footholds including clean energy legislation. He is referring to the shrinking coastline of Waikiki and the impact that it is having on the island’s mainly native, economically struggling population. Ocasio-Cortez, Ing, and other DSA candidates are proposing bold climate policy that would transition 100% of energy in the US to renewable energy by 2035. They believe that this will close economic and labor gaps. They are promising that a strong, resilient and fair economy can be achieved by directing the ingenuity and skill of the American workforce towards the energy transition. This, they say, will create millions of jobs and lead to a more equitable society in the process. Ambitious Climate policy is not new in the Democratic political landscape. Some of the party’s most influential leaders have put their weight behind bold legislation to curb Greenhouse Gas emissions and transform the US energy sector. In 2009, the Democratic House passed H.R. 2454, a bill that outlined a national cap-and-trade market and mandated a renewable portfolio standard of 25% by 2025. The bill never made it through the Senate. It was ambitious, even by today’s standards, and most experts believed that implementing its mandates would spark significant growth in clean technology. More aggressive measures have recently been proposed. Just last year, H.R. 3671, the Off Fossil Fuels for a Better Future Act, was introduced into congress. Thirty-seven cosponsors signed onto the bill including Joe Crowley himself. This bill set the – 100 percent renewable energy by 2035 – goal that Ocasio-Cortez later adopted in her lead-up to the primary race. Despite these initiatives, progress in transitioning to carbon-free energy has been slow. As candidates like Ocasio-Cortez, Ing and others see it, establishment democrats lack the political will to turn climate bills into laws, because in large part, their campaign treasuries are filled high with donations from the fossil fuel industry. Ocasio-Cortez and Ing, along with Rashida Tlaib from Michigan, Randy Bryce vying for the Wisconsin seat being vacated by Paul Ryan, and 310 other Congressional candidates signed on to the No Fossil Fuel Money pledge, refusing to accept donations from PACs, executives, or “front-groups” of fossil fuel companies. They say that by avoiding this conflict of interest, they can take the firm action on climate change that current Democratic lawmakers are only able to give lip service to. Many however, see turning down fossil fuel money as too big a campaign risk in an election process where cash is king. OpenSecrets.org reports that in the 2016 elections the fossil fuel sector contributed over $100 Million in campaign contributions, making it the largest contributor of campaign funds out of every measured sector. The tide, it seems, may be turning on the importance of a campaign treasure chest to winning voters’ hearts and minds. Both Ocasio-Cortez and Ing were outspent by their primary opponents at a rate of 10 to 1 before they both delivered the startling upsets that ushered them into national attention. Another key factor that differentiates the climate policy vision of the insurgent candidates from that of the old guard lies in who would lead the massive investment that energy transformation will require. Since the American Recovery and Reinvestment Act of 2009, renewable energy and climate policy has mainly focused on market driven solutions. Policies relied on tax credits, loan guarantees, and grant funding to incentivize private sector investment in energy technologies. The Production Tax Credit (PTC) and Solar Investment Tax Credit (ITC), for example are recognized for catalyzing the rapid growth in solar and wind power that took them from less than 1% of total US energy production in 2007 to over 10% today. Underlying the Democratic-Socialists’ plan for energy transformation is a firm belief that Government has the capability to invest trillions of dollars directly into industries currently controlled by the private sector, if only legislators had the political will to authorize such expenditure. Ocasio-Cortez, who calls herself an “Environmental Hardliner”, criticizes market-based approaches as half-measures. Instead, she is calling for a centralized approach, empowering Government to lead the way rather than hoping for private sector action. She points to Puerto Rico, which has been slow to regain a stable power grid, as a prime example of why central planning from Government is the only way forward on energy. Over the last month, however, beyond reiterating the high-level concepts of a Green New Deal or new Marshall Plan, Ocasio-Cortez has not provided any insight into her strategy for achieving these lofty policy goals. In an email inquiry trying to obtain more information on the candidate’s plan, her staff responded saying that they “hope” to be able to provide more concrete information soon. Ing plans to achieve this by partnering with labor unions and environmental groups to generate groundswell in congress for federal job guarantees, labor agreements, and community owned renewable energy. Congressional candidate Kaniela Ing has experience legislating on clean energy market transformation through his work in the Hawaii State Legislature. Randy Bryce is another candidate whose platform ties clean energy to job creation. A former steel worker, Bryce believes that the job insecurity faced by today’s steel workers can be eliminated by retooling the industry and focusing it on domestic wind production. Like Ocasio-Cortez and Ing, Bryce sees Government investment as the key to this. Can they really live up to their promises on clean energy? The change that Ocasio-Cortez, Ing, and others are committing to deliver will require immense political capital that freshmen in Congress typically do not have. Furthermore, as Ocasio-Cortez herself points out, it will require deep structural change and trillions of dollars of Federal investment. That could lead to a rapid increase in the nation’s debt. On the other hand, if these candidates do enter the next class of freshman Congress-men-and-women, it will be without being beholden to either fossil fuel interests or their own party’s leadership. That may empower them to disrupt the legislative cadence enough to make real progress in their first terms. There is little insight into how, exactly, these candidates will attempt to turn their respective visions into realities. But any progress on the ground could mean significant steps forward for solar and wind companies. Even if the DSA candidates’ initial progress is limited to tax credit extensions or direct, program specific investments, this would mark a significant turning point for clean energy, thrusting into the limelight as a first-tier issue. That, ultimately, is what may open the pathway towards full decarbonization.